Yu Tong snorted softly and didn’t utter a word. Meanwhile, Nie Tian looked blankly at Qi Yiren. Amused by her words, he said, smiling, “I don’t plan to take a wife yet, young miss. But if I do plan to get married, I’ll give you some serious consideration. Okay?” He found the girl very amusing. Xuan Yue’s appearance resembled Xuan Ke’s to a large extent. She was wearing succinct, white combat garments. Even though she wasn’t wearing any makeup, her face was jade-like and charming. “It’s my brother’s honor that you’d consider him a strong rival,” Xuan Yue said. After Qi Yiren and Xuan Yue, the girls crowding around Nie Tian took turns to state their identity, hoping to gain Nie Tian’s attention. Smiling, Nie Tian bowed back to them one by one. He could see that these gorgeous young women from all over the Domain of the Falling Stars didn’t just come upon their sects’ request. Many of them were simply curious about him and thus had come to see him for themselves. Of course, their seniors must have reminded them before they had come that Nie Tian was now the brightest rising star throughout the Domain of the Falling Stars and that they would receive unconditional support from their sects if they could win his favor. Therefore, some of these lofty girls had come with the intention of sweeping Nie Tian off his feet, while others had come out of curiosity or admiration. However, most of the girls didn’t show any interest in getting to know him. Very few actually talked to him. All of them fixed their eyes on Nie Tian as they sought opportunities to move to the front and talk to him. After handling the crowd of beauties for a while, Nie Tian felt a headache coming on, and then gazed into the distance. He saw that the unearthly gorgeous Dong Li was standing side by side with her aunt Nie Qian on the balcony of one of the bamboo buildings. She was eating grapes from a bunch as she talked and laughed with Nie Qian. She pointed at him from time to time, as they were apparently making fun of him. “They’re laughing at me...” Nie Tian said inwardly. As he withdrew his gaze, he discovered the An sisters, who were standing behind the beauties from the other realms. They seemed to be hesitating to squeeze through the crowd to see Nie Tian. He could tell that they were feeling inferior to the other girls. They wanted to meet Nie Tian, but they had scruples. They knew that even in the Realm of Flame Heaven, the An Clan was an insignificant clan, which had been abandoned by the Spiritual Treasure Sect. Compared to ancient powers like the Ice Pavilion Sect, the Tool Sect, and the Cao Clan, which had stood prosperous in the Domain of the Falling Stars for thousands of years, their clan was nothing. Perhaps that was why the An sisters were so hesitant. Nie Tian had planned to visit his grandfather first. Considering his current cultivation base, he was able to locate Nie Donghai effortlessly with his psychic awareness. However, a moment ago, he had noticed that one of the windows of the building, which seemed to be Nie Donghai’s residence, had shut after opening briefly. As he walked through the crowd of beauties towards the An sisters, he caught sight of Yu Tong, who was standing behind the crowd. However, she had a joyous smile on her face since Nie Tian had ignored the chosen from the powerful sects and come to talk to them. Upon hearing these words, Nie Tian recalled the time he had met her for the first time in the Nie Clan. A hearty laugh escaped his mouth. Then, the three of them chatted casually about what they had all gone through over the past few years and funny stories from the past. The girls from the other realms also showed strong interest in the contents of their conversation, and thus quickly gathered around them and listened in silence. After an unknown period of time, only when it was getting dark did Nie Tian split off from the An sisters and walk towards Nie Qian’s residence. She seemed to worry that Dong Li would misunderstand their relationship, and thus explained, “Li, the An Clan and our clan have been friends for many years. Back when we were in trouble, the An Clan exerted their power to help us. Nie Qian had long since heard that Dong Li had stood by Nie Tian no matter what and defended him with everything within her power. “It’s great that you can understand,” Nie Qian said, smiling. Approaching the bamboo building where Nie Qian lived, Nie Tian noticed that two young women were playing chess on the balcony of a nearby building. They were Ye Qin from the Yin Sect and Qin Yan from the Water Moon Chamber of Commerce. Since the two of them already knew Nie Tian rather well, they didn’t join the chattering young women that had swarmed to him. Only when Nie Tian walked by did they turn to smile at him. Smiling, Nie Tian nodded back at them and went on towards the building where Nie Qian lived. “Unlike those girls, I’m here for business,” Ye Qin said with a subtle smile. As the two of them talked, Nie Tian went up to Nie Qian’s residence and saw his aunt, who he missed deeply. “But anyways, if your mother was still alive, she would be even prouder than I am.” Nie Qian’s eyes welled up as mixed emotions rose in her heart. All these years, she had brought out her strongest side to face countless difficulties. On this day, after seeing that Nie Tian had gained such exceptional abilities and influence, she thought of her late sister and finally let her emotions overwhelm her. The Azure Dragon is the mythological creature in the East, as it is said that when the seven mansions in that area (Horn, Neck, Root, Room, Heart, Tail, and Winnowing Basket) are joined up, they form the shape of a dragon. 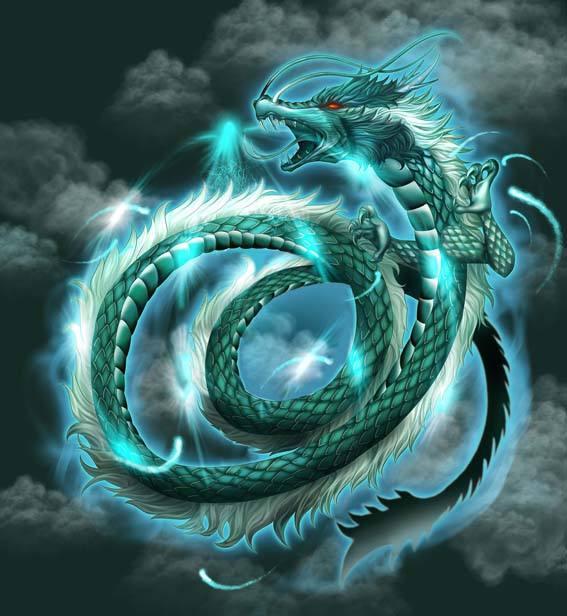 The Azure Dragon corresponds to the season of spring. As the dragon is considered by the Chinese as the noblest of animals, it is the head of the Four Symbols. Although Chinese dragons are commonly associated with water, the Azure Dragon is the exception, as its element is wood. In Chinese mythology, the dragon is regarded as a fearsome and mighty creature. Yet, unlike their Western counterparts, Chinese dragons are believed to be just, benevolent, and bringers of wealth and good fortune.